How We Break The Moody Broody Hen So She'll Start Laying Again! We raised chickens for the very first time last year and they were an absolute blast to raise. But we sold them all in late fall. I was afraid that free ranging hens in the winter months would just make them easy prey for predators since food gets more scarce in the wintertime. But the entire time we had them it was so much fun to watch their antics. And of course we enjoyed those fresh free-range eggs. There’s absolutely nothing like the taste of a free-range egg, you chicken raisers know what I mean! So we were pretty excited to raise chickens again this year. We contacted a local breeder and purchased 4 hens from her and BOOM! We were back in the chicken business. But one of the hens quit laying eggs & became broody several weeks after we purchased her – we’d never dealt with broody hens before. And with no rooster in our flock it wasn’t helping anyone, her or us. Since I’d never experienced broodiness in hens I allowed her to sit for a few days thinking it would soon pass. She quit laying eggs but was always sitting on the nest each time I went to check on her – even though there were no eggs for her to sit on. Keep Her Away From Nesting Boxes? I put out a plea on our Facebook page for advice and there were many great ideas. One person said they move their broody hen further away from the nest and she usually gets distracted enough not to go back to lay, but our girl always went back. So I started closing the chicken coop door when I let them out each morning so she couldn’t get back to the nest. But it also kept the others away from the nesting boxes. I didn’t like that solution. Hummm… What else can I try? By now she’s been broody almost three weeks! Another Facebook follower recommended a page with great information on breaking broody hens from a person whom I consider to be the authority of raising chickens, Kathy over at The Chicken Chick. (slaps forehead) Why didn’t I think of her in the first place??? Her article had great advice and I learned a lot. First of all broody hens like it dark & quiet with a soft feathered nest. Our task is to give her the opposite circumstances so she’ll find being broody uncomfortable. It will help break her broodiness faster. I had heard that advice before from a veteran chicken raiser. (thanks dad!) But Kathy laid it all out with pictures and examples. So RancherMan & I followed her advice to the best of our circumstances. We didn’t want to buy any special equipment so we just used what we had – a large dog crate. Now I’d have preferred our broody-buster to be a little smaller but hey, use whatcha got is what I say! It’s a good location to keep an eye on her and keep her safe from predators. I know her Broody-Buster pen needed to be kept somewhere bright as those conditions are less conducive to her being broody. The porch gets shade during the hot part of the day, but it’s plenty bright. She will be staying on our hard cement patio (with paper laid down first of course) which will make it slightly more uncomfortable for her. I would have loved to follow Kathy’s advice and elevate the cage so air could circulate to keep her belly & chest cool. But the grid on the bottom of this dog crate was very open and we didn’t have any extra chicken wire to reinforce it. This setup will just have to do. Our Mini Schnauzer Bailey can see the hen from the living room windows and also walk past the hen when we take her outside. We’re hoping that desensitizes her to chickens and makes them more safe around her in the future. We only adopted Bailey a couple of months ago & she’s always been way too energized around the chickens when we take her to the coop on a leash. So this continues her training. Here’s how it worked for us: We put a couple of feed sacks beneath the crate to catch droppings. We still had a small chick waterer from when we raised day-old chicks last year. So we brought it out and filled it with fresh water. We added a Homemade Chicken Feeder that we had thrown together last year out of parts we had laying around the house. When her new diggs were ready I went to the barn’s coop (where I KNEW she’d still be). I scooped her up gently and carried her to the house. I’m fortunate that she doesn’t get aggressive even though she’s broody. I understand aggression is pretty standard for broody hens. That would have made this part more uncomfortable for both of us. Once she was in the Broody-Buster she was pretty irritated, clucking away and pacing the cage. She became more & more uncomfortable the longer she stayed locked in that cage, looking around for a way to get out and pacing away. Sorry girl, this is going to be your new home for a few days. But it’s for your own good. But what about Bailey’s interactions? She was keenly interested in the hen at first. The interest had her going around the cage with some excitement and sniffing at the crate, even yipping at the hen from time to time. But just as we had hoped, as time went by she didn’t show the hen more than a casual glance. We purposely brought Bailey close to the crate on several occasions. We wanted her to learn that this critter was allowed here and was not to be harassed. The hen stayed in the Broody Buster for 3 days before we carried her back to the barn to see how she reacted. Nervously we set her down next to the other hens as they scratched around in the dirt at the barn. HOORAY! She was back to her old self hanging out with the other hens, chasing bugs and taking dust baths. We’ll be sure to keep this broody buster in mind when one of them starts to go broody again. Next time we’ll nip that habit in the bud more quickly! 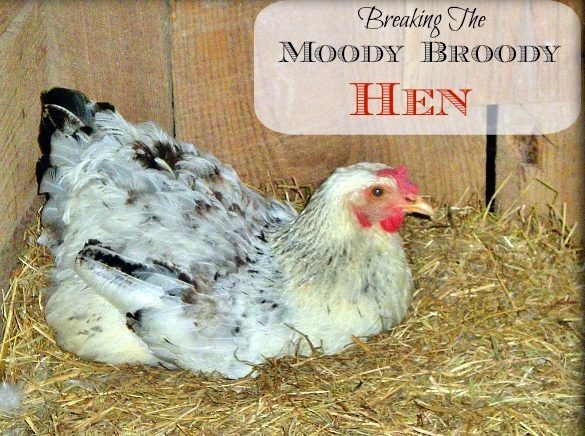 What are your favorite ways of dealing with a broody hen? What Color Eggs Will My Chickens Lay? This entry was posted in Blog Posts and tagged Barn, Chickens on June 29, 2014 by Texas Homesteader. These are some great tips! I don’t have any chickens… yet, but I’ve been reading about them so I’m prepared when I finally get my coop ready! Thanks for sharing with Thursday Favorite Things! I’ve had the worst broody hen season EVER this year. First my Maran went, and it took 2 weeks of isolation and ice packs to break. Then the Buff when broody. I let her sit the full time and stuck chicks from the feed store under her, but she rejected them (arg!) and was still broody. Then the Maran went again….FINALLY got both broken after about a week in broody isolation jail. Then m old mama bird who broods once a year went, so we stuck under fertile eggs (we don’t have a rooster) and she hatched out 5 chicks. Hopefully we are done with this mess! This is great stuff….local birdies here also have better free range eggs! You’re so right about that. No birdies yet…thinking of raising them for the end of the year….I have not made up my mind yet. But if I keep visiting you I may very well start. I’m going to try this with Henrietta tomorrow. She has been in the nest box for a few days. I’ve taken her out to join her sisters and she runs right back to the nest box, so she’s being stubborn! I’m hoping this will work. Thanks. Thanks for sharing ! We want to start getting chickens and are learning what we can before we get them! So this helps,Thanks! We have 7 broody hens right now — it just kind of happened. We have roosters so some of the eggs are fertile. But non broody hens are laying their eggs in the nests and it’s just become a mess. We’ve marked eggs with X’s and after 3 weeks we’ll have to decide what to do with all the unhatched eggs and the broody hens. Thanks for the ideas in the post and in the comments. Thanks also for sharing at Simple Living Thursday! We look forward to seeing you again this week. I’ve got a couple of broodies now I should try this with. Thanks for sharing it. Pinning. First off. I love the ‘slapping head’ part…I think you were cracking up because of her name not because it was a ‘duh’ moment! Duh on my part! I loved reading this! Don’t stop posting please! I love your taking your time with the dog and keeping everyone safe but acquainting them with each other! You bless this poor ‘old suburban girl’. I only had chickens for a couple of years and they weren’t even mine. Belonged to a border but she rarely got the eggs so we enjoyed them! Thanks for sharing the homestead! I’m sure you will think this is a silly question, but I really don’t know. So if you would be so kind as to indulge me, here goes……are hens and chickens the same thing? Or are there some differences? Thank you! The easiest way to break a broody hen without relocating her is to place a board over your nest boxes in the evening and all through the night. After three days of removing my broodies from the nest boxes in the evening and putting a board over the nest openings until morning, all three of my broodies were broken. In fact, one of them that was less broody was broken in two days. This way, I didn’t have to clean up a separate cage or have the broodies away from the others. ours will nest on the floor also. I tried closing up the nest boxes, so instead she nested right in front of the box, the little brat lol! We have tried a few different suggestions and we are three weeks in 🙁 My questions are: do u leave her outside all night? What about predators? We have a very secure coop with run (so far- about 4 months now) and I don’t have a wire crate, just one of the huge hard plastic ones. Aside from buying a crate which are too expensive, any other options? I’ve read dunking them in water for 4 mins helps too. Instead of selling the layers at the end of the season, did you ever think of sending them to camp freezer?? I understand they would be much better than store bought birds.